See also MORE FUND COMICS #1 (LIMITED EDITION) and MORE FUND COMICS CARD. AVENGERS/JLA #2 is awesome. It was just what I was expecting! I cannot tell you how excited I am to see #3 and #4. Kurt Busiek posted an interesting take/answers on the Avengers Comicboard (rpl=031022232627). You should read it after you read #2. 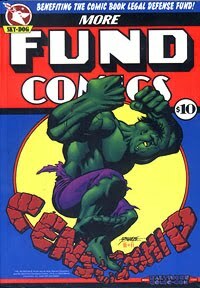 Also, MORE FUND COMICS #1 made their way to the comic book shops today. It was previously only available at the THE BALTIMORE COMIC-CON 2003. I had a great time at the con. George wasn't sketching due to Carpel Tunnel Syndrome (Note: Brace in Photo) but he was signing. I was there both days and had George sign by Crisis TPB on Saturday and on Sunday a copy of the More Fun Comic and two copies of JLA/AVENGERS. Even though George wasn't sketching he was signing up a storm and posing for photos. Everybody Loves George. I attended the CrossGen Panel on Saturday. 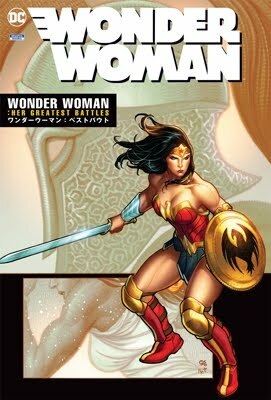 Ron Marz and George talked about THE WAR coming out this spring. Sounds Great!!! I was unable to attend the JLA/AVENGERS panel due to them change time slots on Sunday. Sorry No Transcript this time. I had Tom Smith color some of my previous sketches from George and they turned out beautiful. George had some pieces at the CBLDF auction on Saturday. I was not there the whole time but I did see two of his pieces MORE FUN COMICS cover ($1,000.00) and Original Jim Lee/George Perez Sketch ($1,600.00) sold. George always gives his all when it comes to the CBLDF. I also met a lot of comic creators, some for the first time and some that I have met before. Tom Brevoort, Frank Cho, Geoff Johns, Karl Kesel, Scott Kollins, Martin Nobel and Family, Howard Porter and Mark Waid. Everybody was great!! !